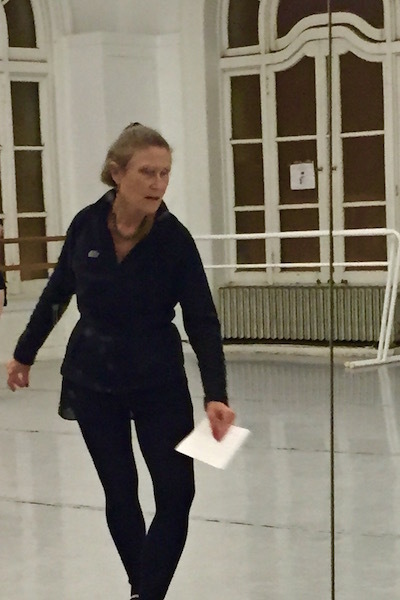 Read my interview with Kathy Mata – an inspirational adult ballet teacher and a pioneer in the ballet community by having an adult ballet company. I first learned about Kathy Mata via an inspirational adult ballet documentary. I later met her in one of my ballet classes at LINES dance center in San Francisco. Read more about my experience of taking class with Kathy Mata. The following is my interview with her. Tell us about your background in ballet and how it led to teaching adults? I come from a family who is quite involved in the arts. My grandmother was a dancer and my aunt a concert pianist. Together with my mother, they thought I would enjoy dance and so my mother took me to creative dance class. I later studied ballet. “I was going to be the best ballet teacher there is”. I later took my teaching certificate in RAD which is from the UK, and much later I obtained my certified dance teacher exam from the USA, which is what you need to be able to teach any where in the United States. What made you decide to focus on teaching ballet to adults? I started assisting and filling in for ballet teachers at 19. I taught a variety of students from children to adults. I enjoy teaching. I like to help people. It was only in 1985 that I felt that my strength was teaching adults. I realised I really enjoyed developing dancers and then letting them perform in our community service outreach programs. I love everything about teaching ballet to adults. I don’t feel that I’ve got any challenges in teaching them. Now that I’m busier, I’ve got a good working relationship with another teacher. I send absolute beginners to her to establish a good foundation and then when they’re ready, she sends them back to me. We’ve got a system of teamwork that is effective so it all works out. With 30 years of experience teaching adults, what would you want to say to the adults who are learning (or thinking of learning) ballet? First of all, understand that we’ve all got different body types and each of us is an individual. That sometimes may affect the way you learn ballet … for instance, I like to say to them, “do not force your turn out”, as I am very serious about injury prevention. I always ask them if they’ve got an injury and many times I send them to the physiotherapist. I also work with dancers who have many injuries and we figure a way to work through them together. I also don’t want them to rush. I want them to work slowly. What are the hardest things for adults learning ballet? I would say, maintaining turnout is one of the hardest and establishing the correct placement. When and how do your adult dancers go en pointe? When I specifically think when they are strong enough. I usually prefer them to wait a couple of years. And when they do go en pointe, they spend a long time at the barre before trying some steps in the centre. I also teach them about pointe shoes and how to break them in. Sometimes it is not just about physical strength or aesthetics – some people just have better feet for pointe. Surprisingly, not everyone wants to do pointe. Some were hurt when they were younger. I was very lucky to have a good teacher who taught me pointe. I also have a professional fitter in my network and I send my students to her to be fitted properly. Tell me more about your adult ballet company, Kathy Mata Ballet. We do a lot of performances with the community. We will perform at least seven times a year but it can be many more. For instance, we do a benefit in November every year, and always for the senior centre which is from the lower income group. They’ve got no family left and they only have us for Christmas. We also do a big yearly performance to raise funds for the company and also for many years, we’ve performed for a brain tumour benefit as featured in the Adult Ballet documentary. I don’t think I’ve heard or know of anything like your adult ballet company! You’ve inspired us. How did you do it? I think I’ve heard of a similar one in England. Initially it was hard because there was nothing like it. It took a long time to build, probably over 25-30 years. It was just getting people who are passionate about dance and want an opportunity to perform. I don’t do auditions. I just find volunteers who are interested to rehearse several times a week. I would book and pay for the studios myself and I rehearsed them myself too. We’re a registered non-profit organization so we don’t sell tickets. We only go by donations. As the company got bigger, volunteers started to help out in other things such as the website, rehearsals and all the organising of events, costumes etc. You’re teaching and rehearsing everyday. How do you manage it all? As the artistic director, I did all of the choreography initially. Now I have an assistant artistic director who helps be the rehearsal mistress because sometimes we’ve got 3 studios booked for rehearsals concurrently! Nowadays my dancers choose their own choreography – they decide what they want to do. We also do all kinds of dance, not just ballet. The most important thing for me is to make rehearsals accessible, especially for busy adult dancers. We’ve got something going on everyday. The main rehearsals are on Friday nights and Sunday afternoons. I make rehearsals available seven days a week. I worked very hard to to ensure there was a rehearsal everyday. It is usually in the studop after class. I’ve been at LINES for 20 years and so they give me a teacher’s discount and the company pays for the studio rentals. Everyone’s in the loop so they can organise their rehearsal times. It was very difficult in the early years but I would say that my adult ballet company is running smoothly now. People come and go but we’ve got it all worked out. Any aspirations, goals or dreams for Kathy Mata ballet? I would love for us to have a big theatre where we could bring the seniors in. The Conservatory of Music gave us their theatre space of 300 seats for our performance in 2012. That was wonderful. Now it is getting harder. Most of the places don’t offer a free theatre anymore. They used to. Now they only give us a discount. How has adult ballet changed over the years? What do you think the future going to be like? How I see it is that it is getting more accessible for adults to learn ballet. People are starting tor realise the many benefits of learning ballet as an adult. It is extremely helpful physically and mentally. Even the football players are doing ballet. As San Francisco is a big city, I’ve got many tourists-dancers like yourself coming in my classes and they’ll tell me about adult ballet back home. In some areas, ballet is still quite backward. For instance, I heard there is no adult ballet in Italy! Just open classes. There are many similar situations in other countries. I’m sure eventually it will change. To read about what it’s like taking class with Kathy Mata, read about my experience here. To read more about her adult ballet company – here is the link to her offical website.